Broadway Limited Imports --4-8-8-4 Big Boy 25-C-100 Coal Tender As-Delivered - Sound and DCC - Paragon3 -- Union Pacific #4009 (black, graphite) -- This locomotive features full Paragon3 sound and DCC for realistic sound and motor control. The Paragon3 sound system works with all Broadway Limited Rolling Thunder(TM) advanced sound systems. Other features of this steam locomotive include a heavy die cast chassis, smooth-running flywheel-equipped drive, directional lighting and magnetic knuckle couplers. 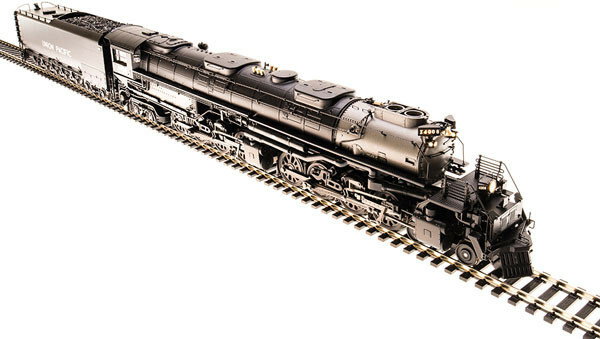 This HO Scale Big Boy 4-8-8-4 locomotive can be operated on all DCC systems as well as on standard DC railroads (with limited sound functionality). This model has wheels profiled to operate on Code 83 and larger rail and curves of 18" radius or larger. The Big Boy 4-8-8-4 comes with roadnumber and era-appropriate details, coal or oil tender and other details.